Musical competition is something that has existed since humans started making music. And if you like traditional big band music from the 1930s and 40s, it doesn't get much better than this. 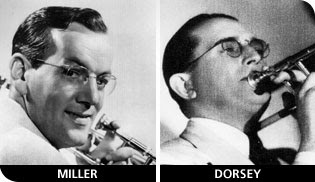 The Glenn Miller Orchestra and the Tommy Dorsey Orchestra will return to San Francisco this Sunday night to square off in a battle of the bands at Davies Hall. Swing and Big Band Examiner Rick Busciglio says that "in the glory days of the Big Bands, many ballrooms promoted a Battle of the Bands. Harlem's Savoy Ballroom, in particular, offered...Basie vs. Chick Webb with Ella Fitzgerald....or Benny Goodman vs. Duke Ellington, etc. They used a revolving stage to present the two bands. Well, the practice continues!" This will be a friendly competition, I'd imagine the "winner" will be determined by each individual listener. The big difference between the 1930s and 40s and now is that the audience won't have a dance floor to reflect how the music is affecting them. The focus will be on the extraordinary musicianship coming from the stage rather than on lindy hoppers on the dance floor. This kind of big band swing music has, in the last century, morphed from "dance music" into "concert music," which is why we sit and listen in a concert hall like Davies Hall. The Glenn Miller Orchestra's "In the Mood"